Buck Woodcraft's stand up paddle board racks offer compact SUP storage on interior or exterior walls. Weatherproof, No-Maintenance Marine Polymer.We make our SUP racks from 3/4" thick King Starboard and assemble them with all stainless steel fittings. Starboard is a high-tech, marine-grade plastic that stands up to the elements better than just about any other material you'd care to name -- which means it won't rot, warp, crack, rust or color-fade after years of exposure. In short, you can install these racks and basically forget them, so far as maintenance is concerned. Sturdy Bases, Easy Mounting. 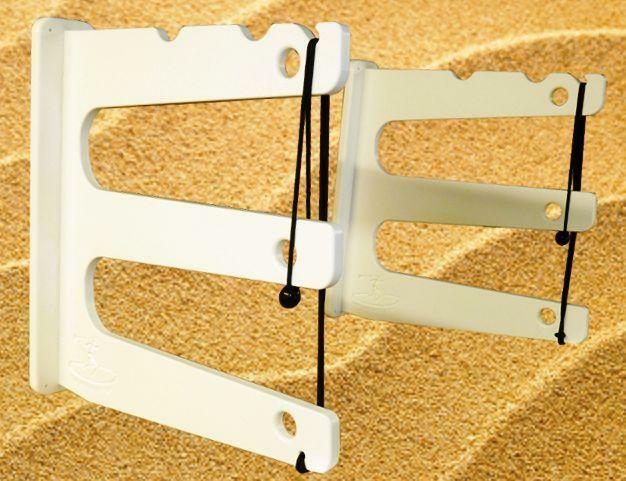 Our SUP rack bases are pre-drilled at all 4 corners for easy mounting using the fasteners of your choice. We strongly recommend that you mount them into wall studs, and definitely not into unsupported drywall or similar panels. And if your board or boards are particularly heavy, you can support them even more securely by adding another set of fasteners in the upper third of the racks' mounting bases. Built-In Paddle Storage, Bungee Tie-Downs, Cable-Lock Openings. Our wall-mount SUP racks include bungee tie-downs for securing paddle boards (and paddles) firmly in place. The racks also incorporate cut-outs for looping cable locks or vinyl coated security chains around your SUPS to guard against theft. 4 Colors, 2 Sizes. Our standard SUP storage racks are White/White, but you can choose any of 4 optional colors at no additional cost. Both models include storage for each board's paddle. Both models include bungee tie-downs for added security. Rack bases are pre-drilled at the corners for fasteners of your choice. Additional mounting holes can easily be drilled for added support. Storage slots taper from 5-3/8" wide at the outermost edge to 4-1/2."